This rolling pin by Tall Oaks Trading Co., owned and operated by woodworker Gary Stewart, is representative of the kinds of items he will sell at the Artisan’s Fair on May 28. 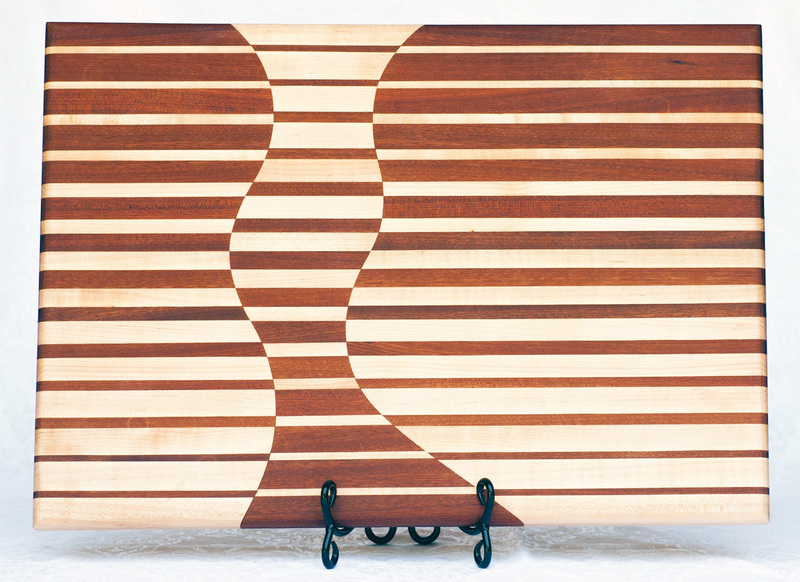 An elaborate cutting board made by Tall Oaks Trading Co. displays the craftsmanship of Gary Stewart. Stewart, who taught carpentry at Sussex Technical High School for 25 years, said he is looking forward to the show, to be held at Lord Baltimore Elementary School. “Too many things, too little time,” he said of his work. Stewart said he was particularly glad to see the recent rainy weather come to an end, so he could run his saw outside, instead of inside the shop. Stewart, who said he believes he inherited his love of wood and woodworking from his grandfather, specializes in things that are “designed toward eating and drinking” — cutting boards, serving trays of varying shapes and sizes, wine holders and wine racks. He said he likes to feature a “live edge” — showing the natural edge of the wood — in his pieces, and leans toward the unusual. “The funkier the better,” he said. Stewart said he lets the wood itself determine what it will become, but “finding the wood is the biggest challenge.” While some of the wood for his pieces comes from his 15-acre farmette, “I don’t have the high, fancy woods on my property.” Still, he manages to acquire a nice variety. Even though woodworking has been a lifelong passion, Stewart said he is always open to new things. Having recently added a lathe to his tool collection, he said he is “trying to make pepper grinders, but I’m not there yet.” In the meantime, he has added decorative rolling pins to his stockpile of offerings — but he has high hopes for the pepper grinders to come. This will be Stewart’s first time having a booth at the Artisans Fair, and he said he was looking forward to meeting other artisans from around the region. “We have so many talented people around,” he said. He’s also hoping for a little old-fashioned trading. For Jo Houtz, a watercolor artist from Abingdon, Md., the Artisans Fair at Lord Baltimore is a fun outing and a chance to show off her art and her sense of humor — two things that are blended together to create whimsical pieces, and some more serious, in her own unique style. “I got bored,” she said, and her instructor showed her some information on an Asian medium she had never seen before — crushed Japanese masa paper. Explaining how she comes up with the ideas for what she calls her “silly fish” paintings, she recalled listening to a conversation between a father and a son, where the son was talking about the need to get a fishbowl for the goldfish he was, at the time, carrying around in a plastic bag. “The father said, ‘Fish don’t bowl,’” she said. And there was her next “silly fish” idea. Although she has about 25 “silly fish” in her repertoire, Houtz said that, for a long time, she was known as “The Bird Lady” because that was her specialty. This will be Houtz’s third appearance at the Artisans Fair, an event she said she enjoys because it’s small enough that it’s not too much for her. “I’m 80 years old,” she said, adding that she finds the Memorial Day weekend fair to be just the right size. Houtz and Stewart will join 70 other artisans at the Artisans Fair, now in its 11th year at Lord Baltimore. Other media represented at the event will include photography, handcrafted jewelry, pottery, metal sculpture, fine textile handiwork and glass. Also on the grounds on Saturday will be a farmers’ market, featuring produce and other food items, such as jams and jellies. The Gardeners by the Sea club will have plant cuttings from members’ gardens for sale at the farmers’ market. The club serves the community in a variety of ways, including landscaping for Habitat for Humanity, offering scholarships for aspiring horticulture students, and garden therapy and floral arranging programs at the Ocean View Leisure Center, and cultivating and maintaining a garden at Lord Baltimore. “We are so pleased that the Artisans Fair has become such a tradition and so successful — both in providing a quality arts venue for our community and by supporting the higher education of young people in this area,” said fair coordinator Maureen Eisenhart. Proceeds from the fair, which is sponsored by the South Coastal Delaware AARP chapter, will go toward scholarships for high school seniors at Indian River High School, as well as adult students attending Delaware Technical Community College. In addition to the items for sale at the show, there will be a chance to win works of art that the exhibitors contribute for a raffle. Winning tickets will be drawn at 2 p.m. A 50-50 cash raffle will also be offered. Food from Delaware Provisions and Rita’s Italian Ice will be available for purchase on site. The Artisans Fair will be held both outside on the school grounds and inside the school building, in the cafeteria and the gym, from 9 a.m. to 3 p.m. on Saturday, May 26. The farmers’ market will be held outside on the school grounds from 9 a.m. to 1 p.m.